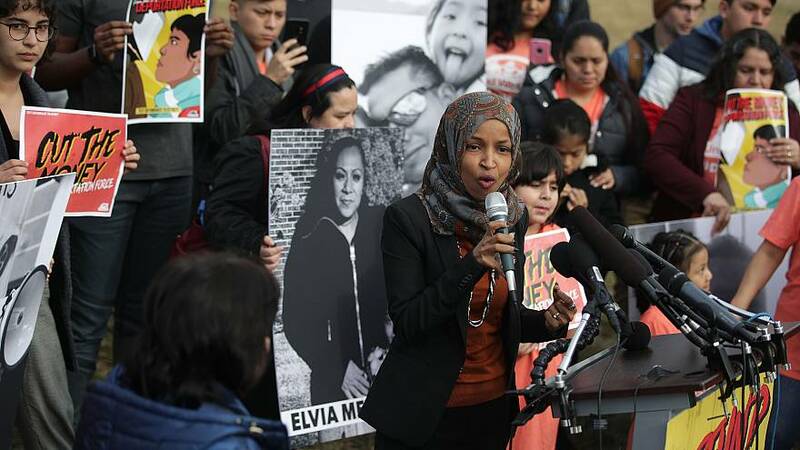 Democratic Rep. Ilhan Omar clashed on Wednesday with Elliott Abrams, President Donald Trump's new special envoy to Venezuela, at a heated House Foreign Affairs subcommittee hearing about the crisis in the South American country. The freshman congresswoman from Minnesota and Abrams had the testy exchange after she questioned his truthfulness, his involvement in the Iran-Contra scandal under President Ronald Reagan and his position on the El Mozote massacre in El Salvador in 1981. "Mr. Adams (sic)," Omar said, calling Abrams by an incorrect name, "in 1991 you pleaded guilty to two counts of withholding information from Congress regarding your involvement in the Iran-Contra affair, for which you were later pardoned by President George H.W. Bush. I fail to understand why members of this committee or the American people should find any testimony that you give today to be truthful." When Abrams tried to respond, Omar interrupted him, saying "it wasn't a question," to which the diplomat countered, "It was an attack. It is not right members of this committee can attack a witness who is not permitted to reply." But Omar kept going, bringing up the 1982 hearing in which Abrams, then Reagan's assistant secretary of state for human rights, testified about the El Mozote massacre in El Salvador during that country's civil war. Tensions grew. "In that hearing, you dismissed as communist propaganda (a) report about the massacre of El Mozote of which more than 800 civilians, including children as young as 2 years old, were brutally murdered by U.S.-trained troops," she said. "You later said that the U.S. policy in El Salvador was a 'fabulous achievement.'" Omar added. "Yes or no, do you still think so?" Abrams responded by crediting the Reagan administration for the country's movement toward democracy, calling it a "fabulous achievement." "Yes or no, do you think that massacre was a fabulous achievement that happened under our watch?" Omar asked. "That is a ridiculous question," Abrams replied. "And — "
"Yes or no?" Omar pressed. "I will take that as a yes." "No — I'm sorry, Mr. Chairman, I am not going to respond to that kind of personal attack, which is not a question," Abrams said. "Yes or no, would you support an armed faction within Venezuela that engages in war crimes, crimes against humanity, or genocide if you believe they were serving U.S. interests as you did in Guatemala, El Salvador and Nicaragua?" Omar asked. "I'm not going to respond to that question," Abrams again answered. "I'm sorry, I don't think this entire line of questioning is meant to be real questions, so I will not reply." Omar then asked, "Does the interests of the United States include protecting human rights and include protecting people against genocide?"